We have spent the last two years testing every Diesel and Bio-diesel Anti-Gel/Flow Improver we could get our hands on. You see, we run B100 Biodiesel Fuel, and treatments that work so on ULSD #2 Diesel Fuel has NO effect on Biodiesel. And Since almost every drop of Diesel Fuel now has some percentage of Biodiesel blended with it, I thought you might be interested in what we found. Most Anti-Gel are mostly solvents, with a few additives and they are so diluted they do nothing. Then we came across a product, produced in PA, and made up of ZERO solvents, but rather 100% additives, but let me caution you...because this product contains ONLY active ingredients, it will get thick and near un-pour able if left exposed to the cold. Using TDT – Summit can actually save you money. Why spend the extra money for blended fuel (#1D or Kerosene blended with #2D) when CFT can do more for less. Blended fuel is both expensive and counterproductive. Number 1D fuel and or Kerosene has significantly less BTU’s per gallon* than does straight #2D fuel. So using these products gives you less energy per gallon. #1D and or Kerosene are more expensive than #2D. If you are like me, tired of being let down by products that promise to keep you running, but far to often you find your self with more regret than results. 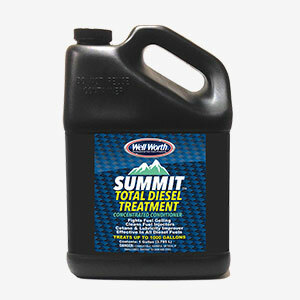 Then SUMMIT is your Winter Fuel Treatment.